Many questions remain unanswered about the observable differences in voting behavior, partisanship, and cultural attitudes among men and women. Latino political participation in the United States is generally lower than the rest of the population, mainly due to their high proportion of youth and foreign born populations that are ineligible to vote. This dynamic is slowing changing, partly as a result of the rapidly growing Latino population in the United States. 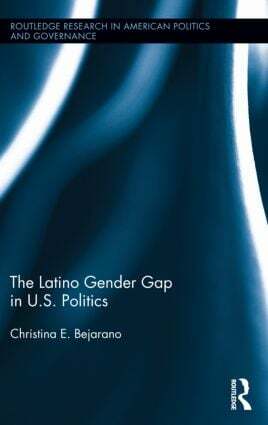 This book delves deeper into the complex gender differences for Latino political behavior. More specifically, it is a political analysis of the diverse U.S. Latino population and the interacting factors that can influence male and female differences in voting and policy attitudes. Christina E. Bejarano carefully unpacks more aspects of the gender category for Latinos, including analyzing the gender differences in Latino political behavior across national origin, foreign born status, and generational status. The Latino gender gap can have far-reaching political implications on electoral politics. As the Latino population highlights their growing political sway, the major political parties have and will strategically mobilize and court the Latino electorate, Latinas in particular.